Please refer to our course page for a detailed course description. Pre-race packet pick up will be arranged closer to the event. Packets can also be picked up the morning of the race beginning at 7am. Packet pick up will close at 8:30am. There will not be a bag check at the race, please plan to leave time to stash your swag bag in your vehicle if picking up on race day. The North and South parking lots at Kamiak High School will be available for your race day parking, and will be open until 8:30am. ​The South parking lots will open first, after the last of the 5k runners and walkers pass by the entry drive. Volunteers and 10k runners are encouraged to use the North parking lot, as it will remain closed until the last 10k runner passes through. 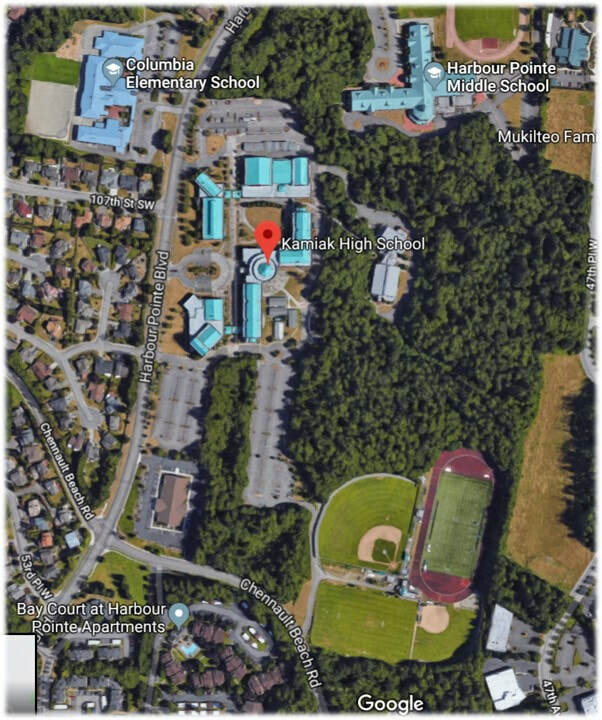 ​Other parking may be available at the Kamiak tennis courts, Columbia Elementary or Harbour Pointe Middle School. Mandatory safety briefing for all runners at 8:45am. ​The 5k run/walk will start at 9:00 a.m.
​All runners and walkers must be off the course by 11:30 a.m.
Where do I go after I park?? The starting area, packet pick up and volunteer check-in are all near the Kamiak baseball field. If you park in the North parking lot, you'll walk along the back side of the school to the South parking lot. From the South parking lot, head to the southeast corner, and you'll find the access road to the ball fields. The 8:45 am mandatory safety briefing will occur by the baseball field bleachers - see the red octagon. Is this your first time running (or walking) in an organized race? First, if you are with your family, make sure you're wearing the bib with the number assigned to you. Each number has been assigned to a specific person, and in our timing program, that number also falls within your age, gender and race category for division awards. Attach your bib using the safety pins provided in the four corners marked by the purple arrows in the picture at the left. Do not pin the white strip at the bottom of the bib. This will be detached at the finish to use as our back up to the timing program. Our youngest runners may not be ready for a full 5k or 10k distance. In this case, consider signing them up for the pre-race Kid's Dash. The dash will be 2 laps around the track at Kamiak for a distance of about half a mile. Kid's Dash participants will receive a race bib and participant ribbon. T-shirts can be purchased if desired, but are not included in the $10 Kid's Dash registration price. Participant's finish times will be tracked using Webscorer. As a backup, we will be using the tear off strips located on the bottom of your race bib. Volunteers will help you to tear these off as you cross the finish. It is important to stay in the order you crossed over the finish line until your bib strip has been torn off and added to the hook by our volunteers. Lungman will be out on the course during the race. You won't be able to miss him... just look for the bright pink oversized lungs. Lungman will start 10 minutes after the last 5k walkers leave the gate. If you can beat him across the finish line, you'll get a special bib tag to memorialize your achievement! For insurance purposes bicycles, skateboards, baby joggers and strollers, roller skates or roller blades, animals, and personal music players are not allowed on the race course. Runners must be able to hear and follow directions along the course at all times. Thanks to Lungbuster Hill, you may not see a PR on this course, but we will be awarding medal tags for the fist place finishers in their age divisions.